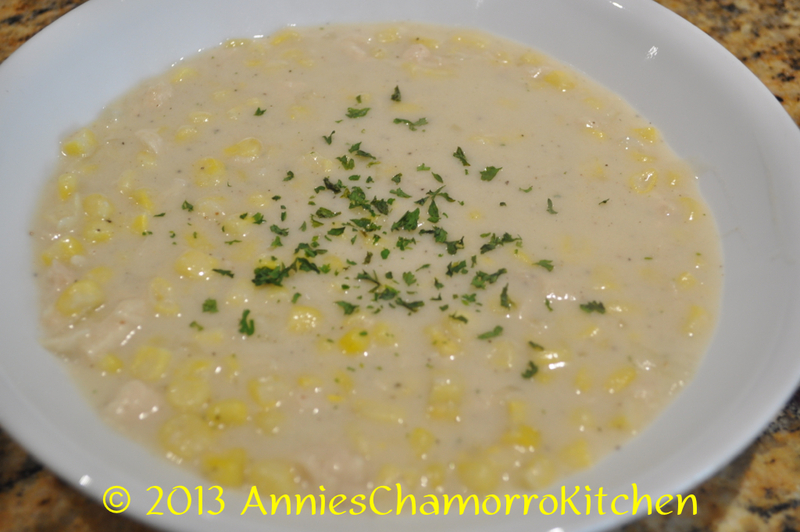 Kådu is the Chamorro term for soup or broth. 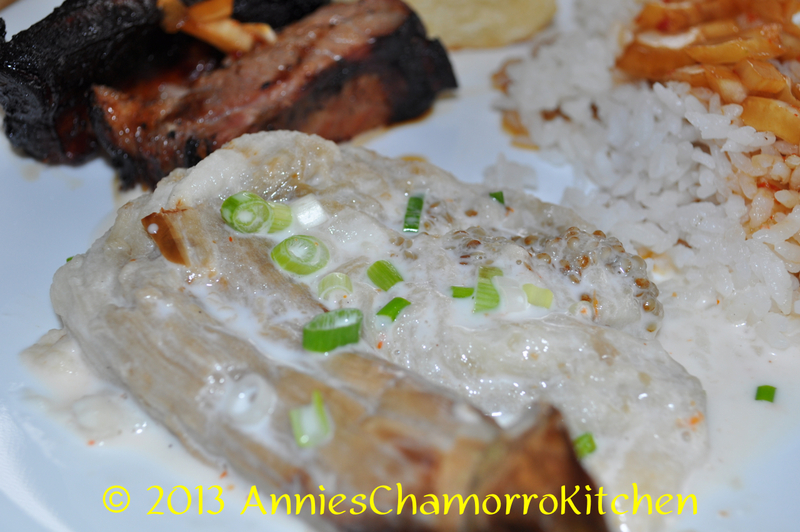 Think of it as Chamorro Comfort Food. It could be 90 degrees outside on Guam, but serve some kådu for lunch or dinner and chances are, you’ll forget your worries–and the hot weather–as you enjoy a steaming bowl of delicious soup. There isn’t a particular occasion that kådu is served. 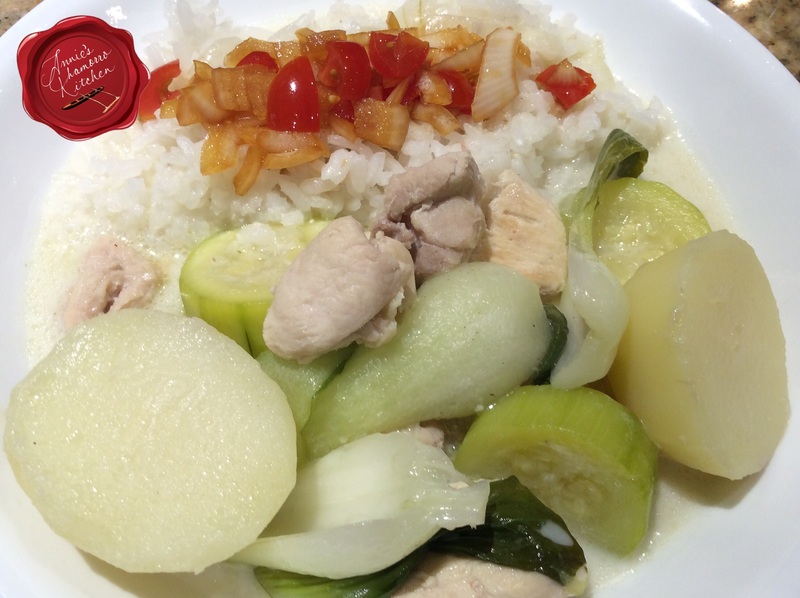 If made at home, kådu is usually served as the main course — chicken, beef or other kådu is the starring attraction, served over steamed rice with fina’denne’ on the side. 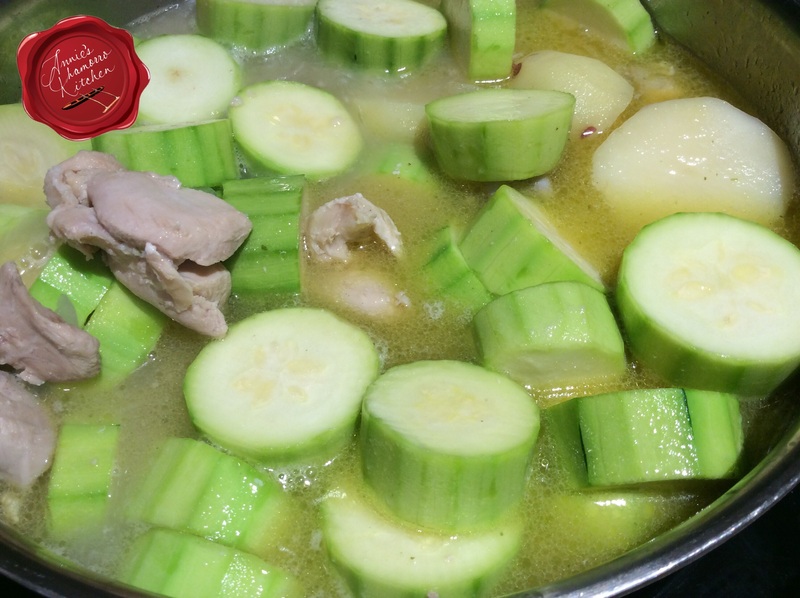 Whereas if you see kadu at parties, it’s usually something more along the lines of a drinkable soup, like Chamorro Corn Soup or Beef Soup with Noodles and Vegetables. Growing up, kådu was made using whatever we had on hand. Most often my mom would make chicken kådu, using the chickens raised in our yard, of course. She’d also add whatever vegetables my dad happened to be growing at our ranch, or vegetables growing in the back yard. My favorite vegetables to add to kådu were squash and pumpkin tips, and if we had some potatoes and onions, into the pot they went as well. Freshly squeezed coconut milk was a must; that was usually my job when I was younger — grating the coconut then pressing out the thick and creamy milk. 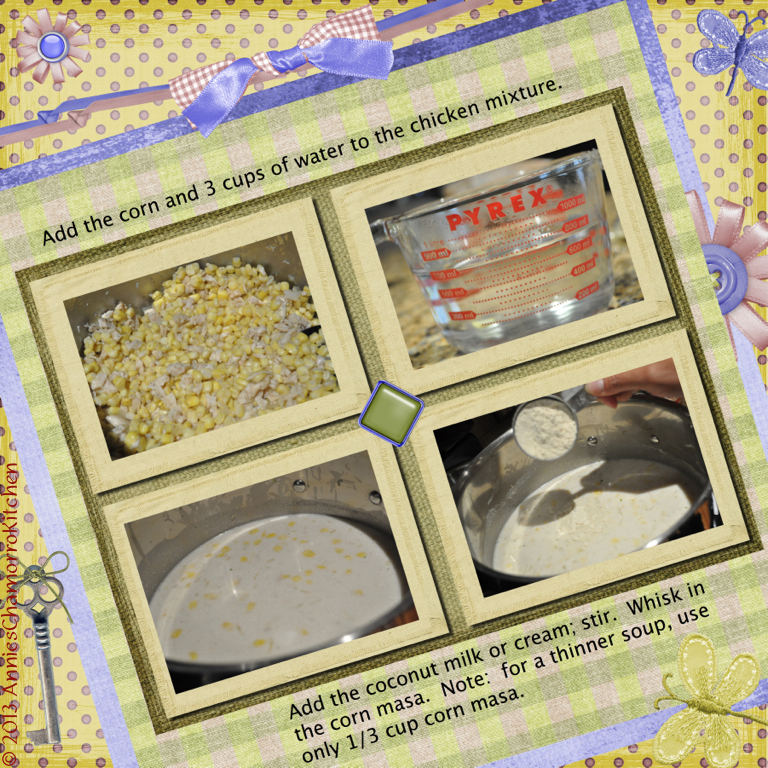 Give my recipe a try. 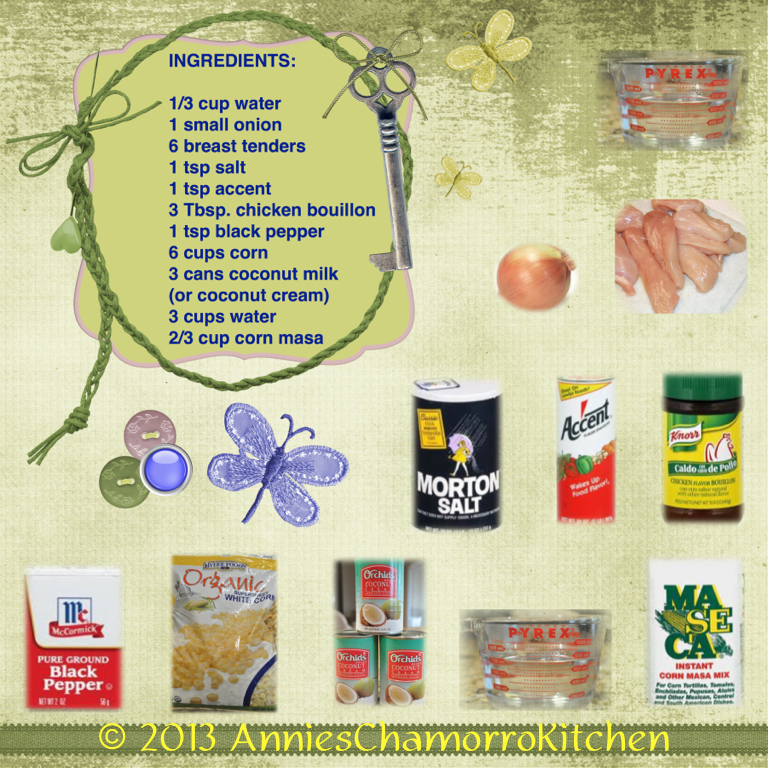 It’s great for those bleary days when warm chicken soup seems to be the only thing to chase the cold away. 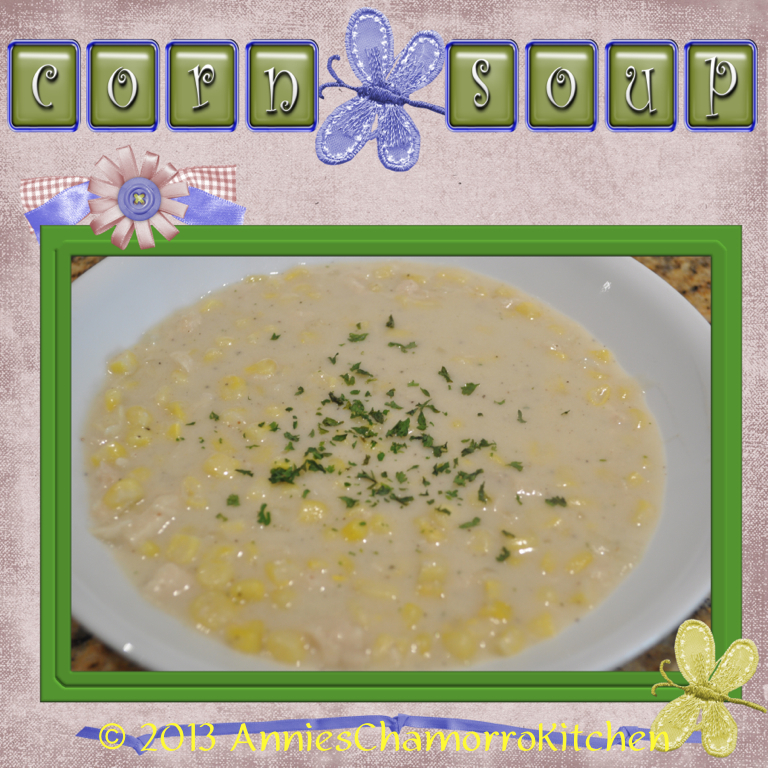 Find my complete recipe at the bottom of this post. 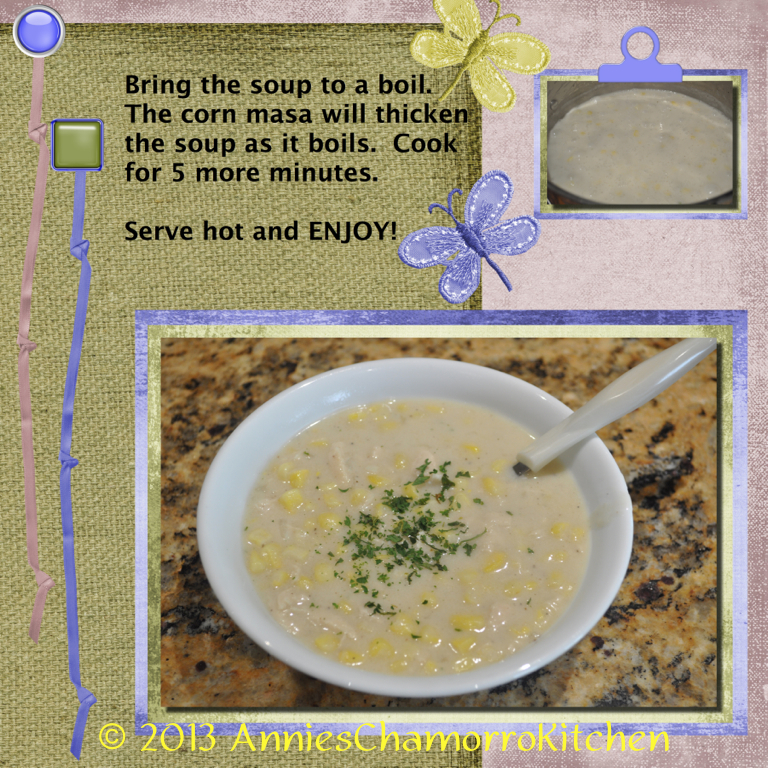 My recipe makes enough to serve 6-8 people, plus enough left over to pack lunch the next day. 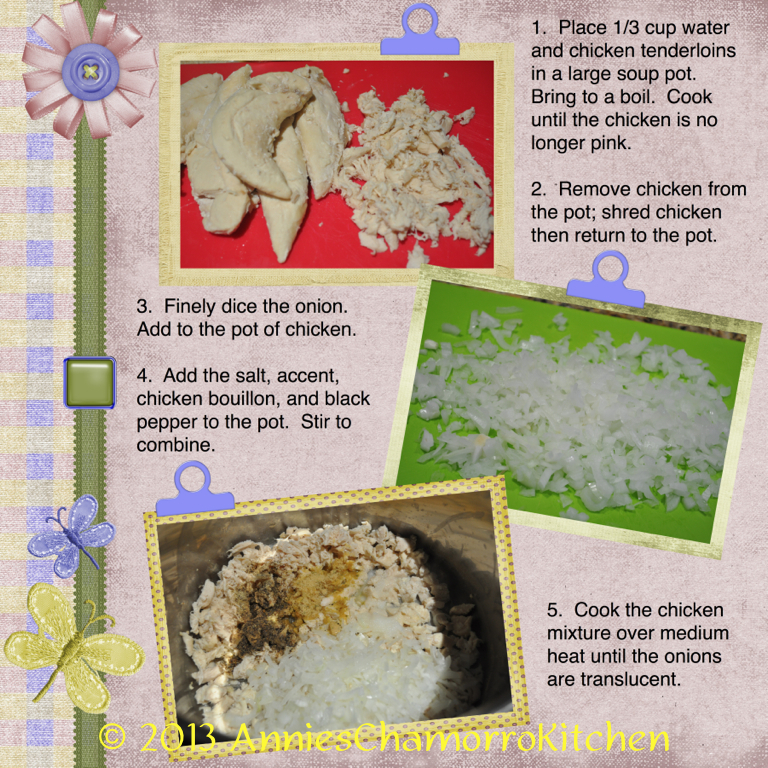 Here’s how to make my Chicken Kådu. 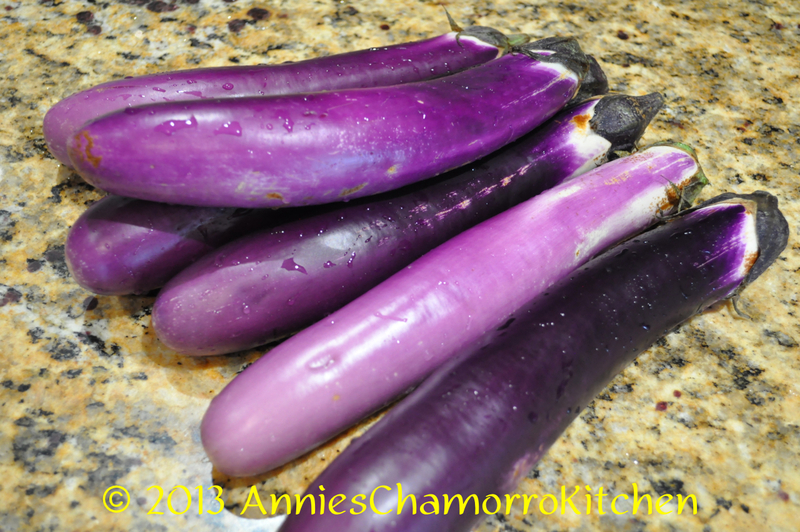 Prepare your vegetables. 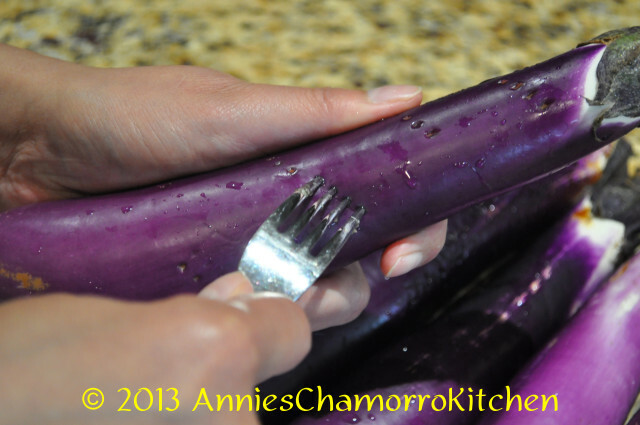 Peel and cut your vegetables in to large chunks. 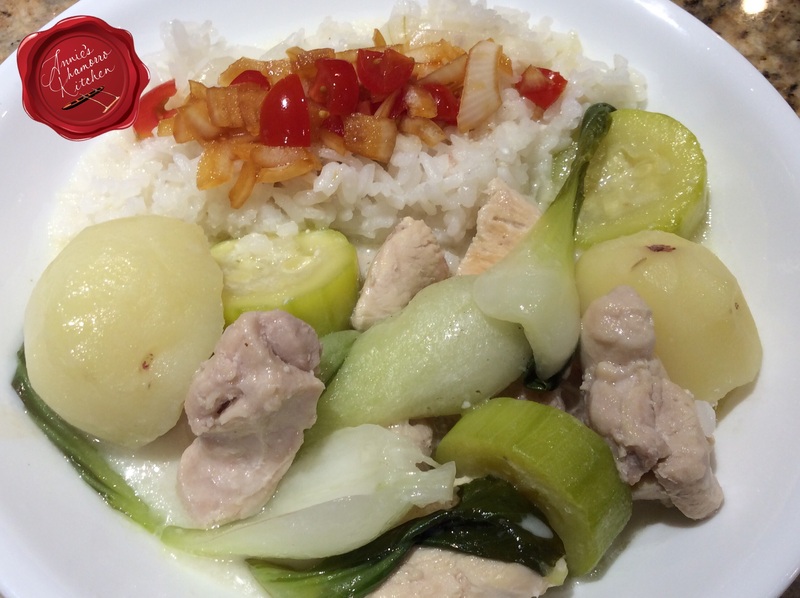 I used zucchini, potatoes and baby bok choy in this version; you can use your favorite vegetables. 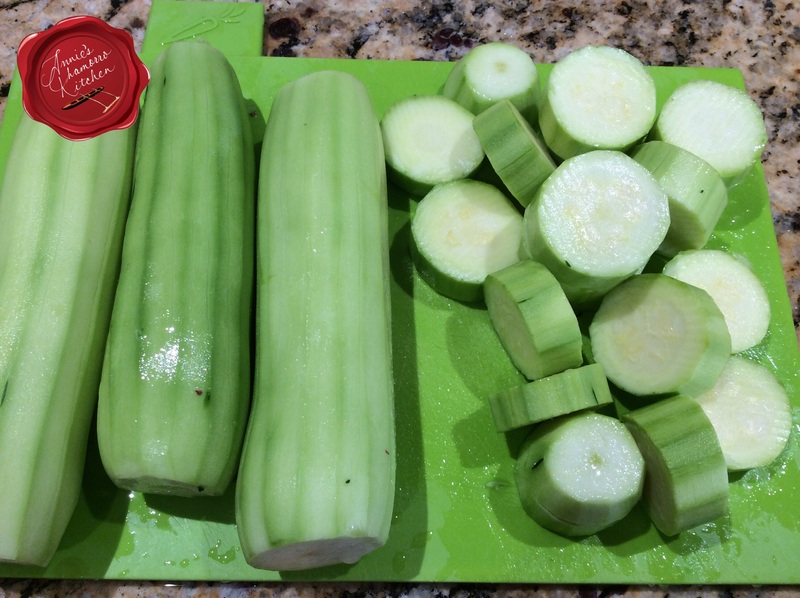 Peel the zucchini and thickly slice them. I sliced these about 3/4 to 1 inch thick. Separate the baby bok choy leaves. Rinse each leaf thoroughly to remove all dirt trapped in between the leaves. Peel and cut the potatoes into large chunks. I used small red potatoes and cut them half. 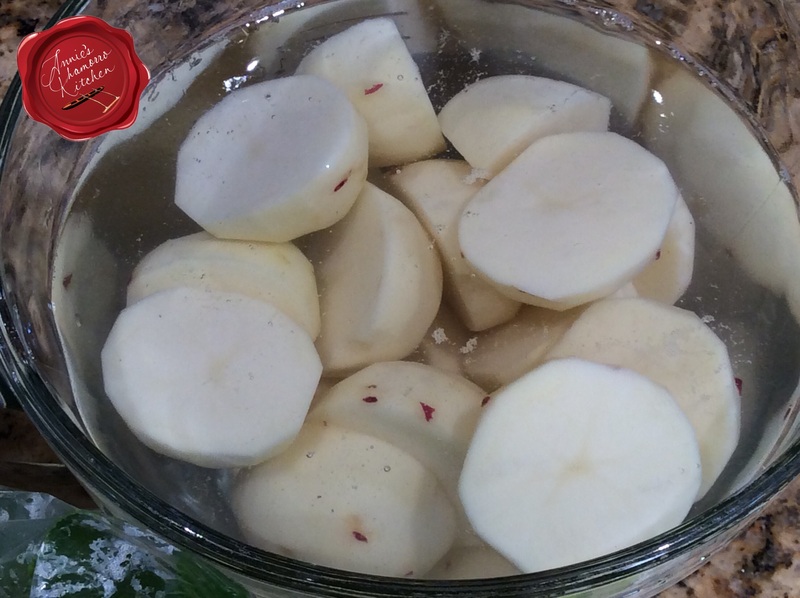 Place the cut potatoes in cold water to keep them from oxidizing and turning brown. Set all the vegetables aside for now while you cook the chicken. 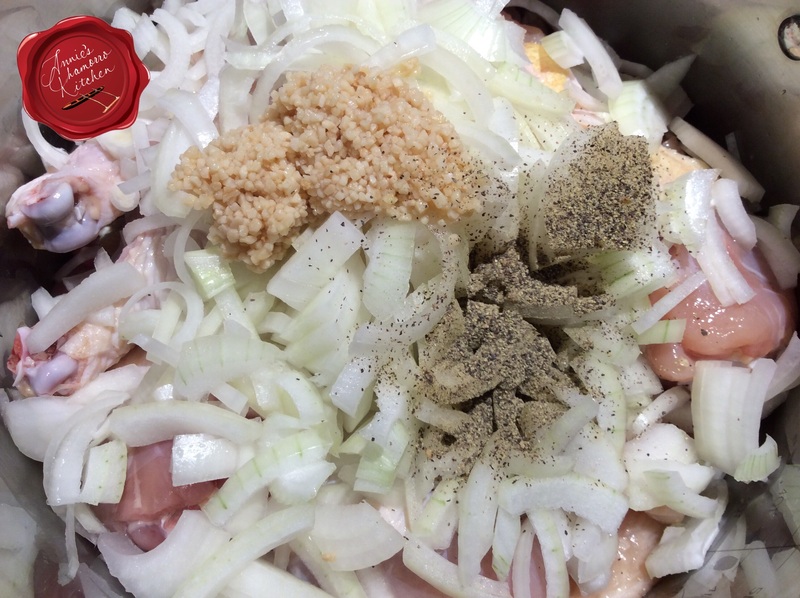 Place the chicken into a large pot along with sliced onions, chopped garlic, chicken seasoning and black pepper. Cook the chicken over medium-high heat until done. Add the potatoes to the pot along with enough water to cover the potatoes. Cover the pot and bring the soup to a boil. Cook the potatoes for about 8-10 minutes or until they are almost done (the potatoes should still be a bit difficult to pierce easily with a fork). The potatoes will continue cooking when you add the rest of the vegetables. Add the zucchini to the pot once the potatoes are just about done. 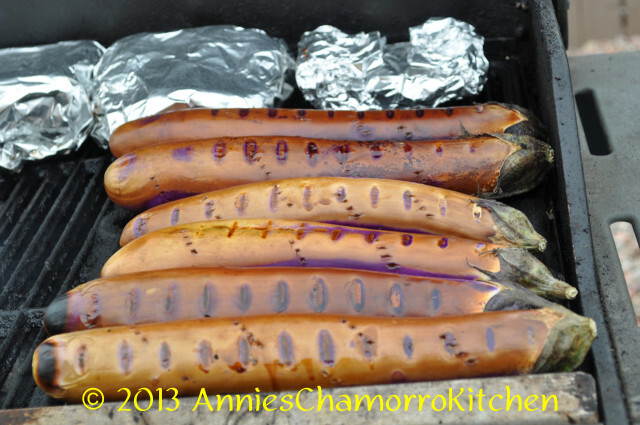 It doesn’t take long for squash to cook, so be sure to add them to the pot at the end. Replace the lid on the pot; cook the squash for just a few minutes. Baby bok choy also cooks very quickly. 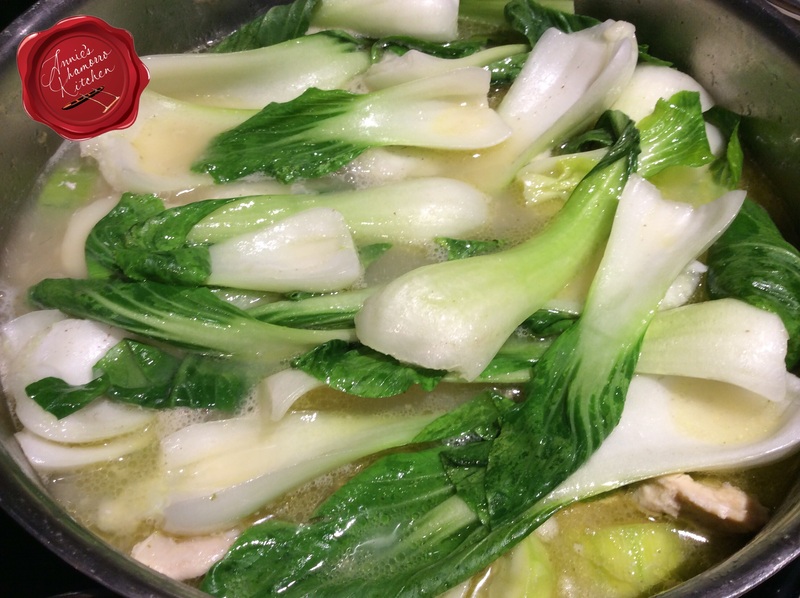 In fact, the steam from the pot will cook the tender leaves sufficiently. 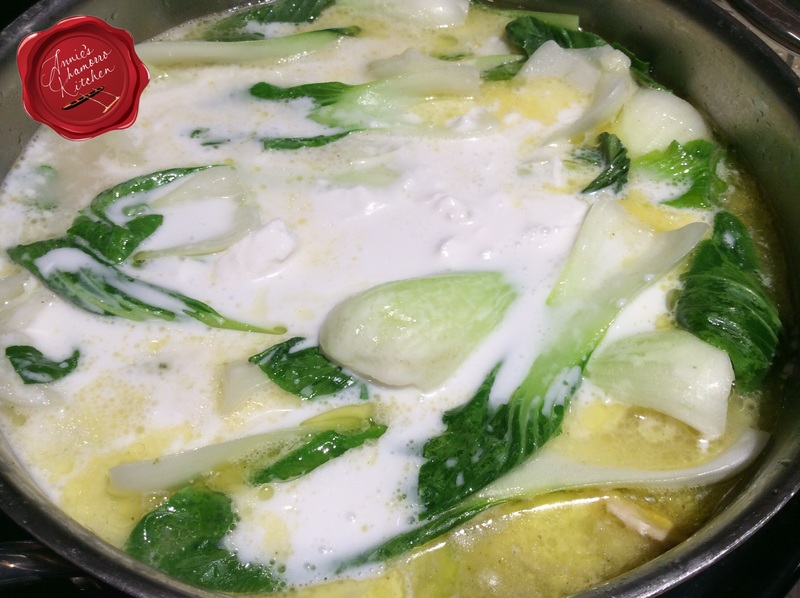 Add the bok choy leaves to the pot once the squash is done then turn the heat to low; replace the lid on the pot. 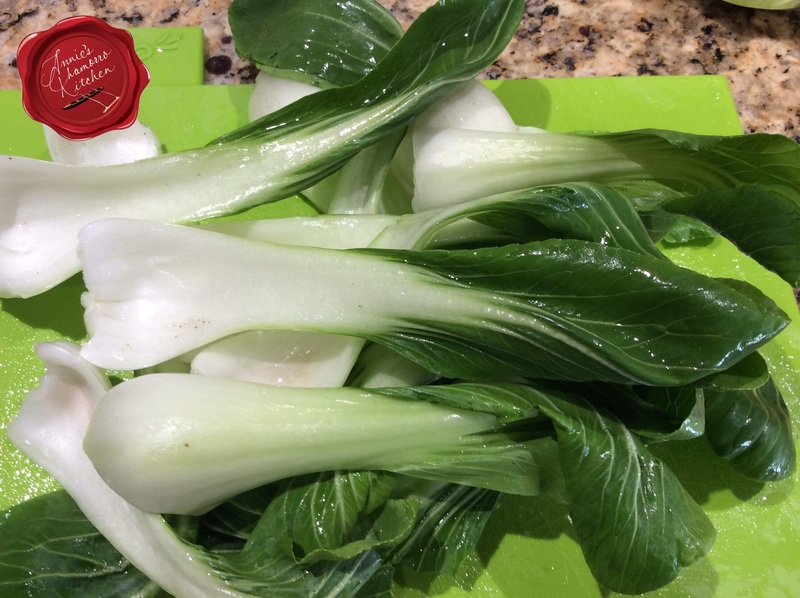 It takes just a couple of minutes for the bok choy to wilt. Turn off the heat once it does. All that’s left to do is stir in the coconut milk. You don’t want to boil coconut milk or it will separate after prolonged cooking. 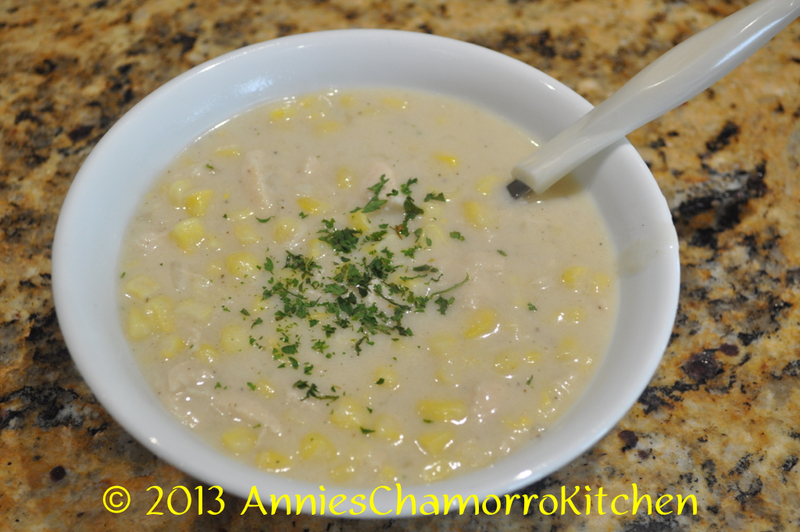 The soup is quite hot at this point, hot enough to warm the coconut milk, which is all you need to do. Give it a stir, then taste and adjust the seasoning if necessary. Add more salt (or chicken seasoning) and pepper, to taste. This is not your ordinary chicken soup -- it's chicken soup with a Chamorro flare, made with potatoes, squash, baby bok choy, and thick coconut milk. 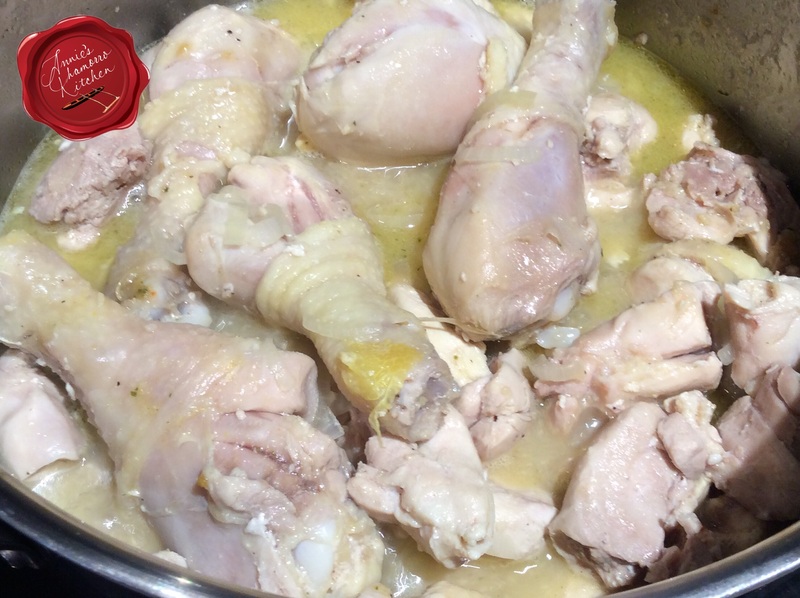 Place the chicken, onions, garlic, black pepper and chicken seasoning in a large pot. Cook over medium-high heat until the chicken is done. Add the potatoes and water to the pot. 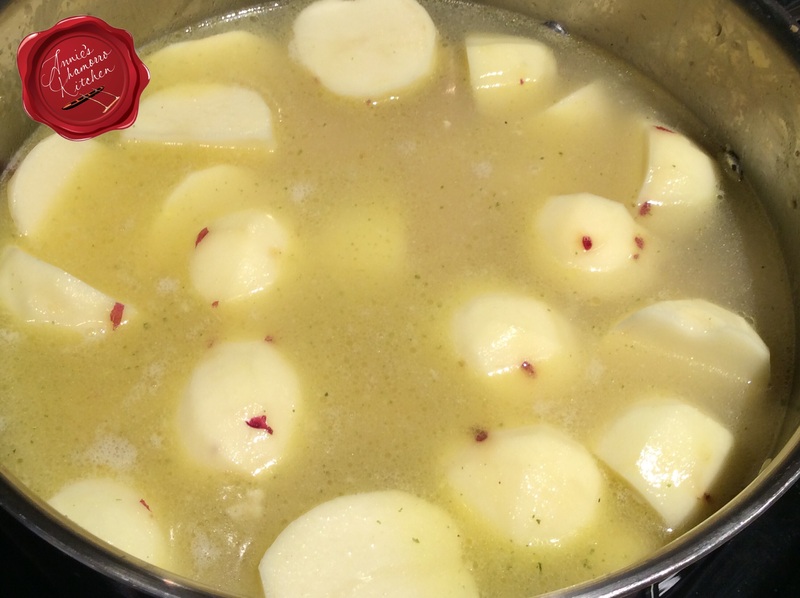 Bring the soup to a boil; cook for 8-10 minutes or until the potatoes are almost done. Add the squash to the pot; cook for a couple of minutes. 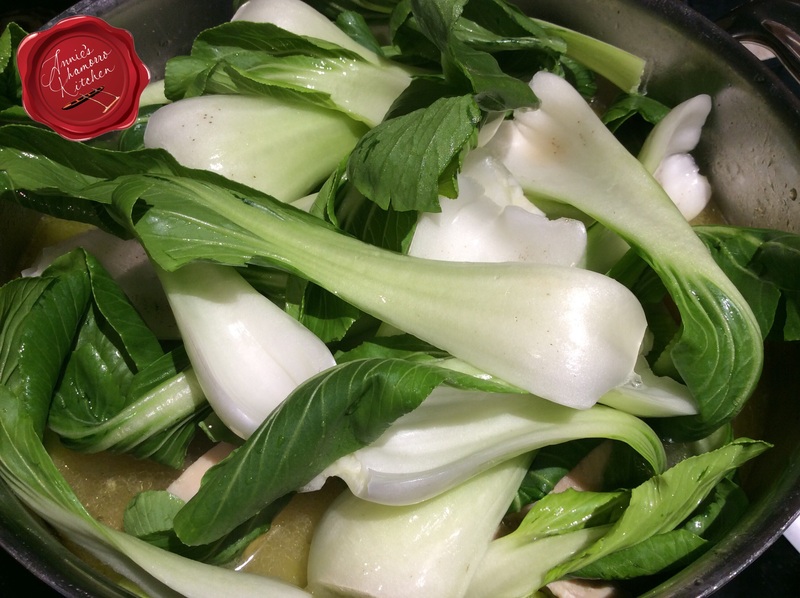 Add the baby bok choy leaves to the pot and reduce the heat to low. Cook just until the leaves wilt. Turn the heat off then stir in the coconut milk. 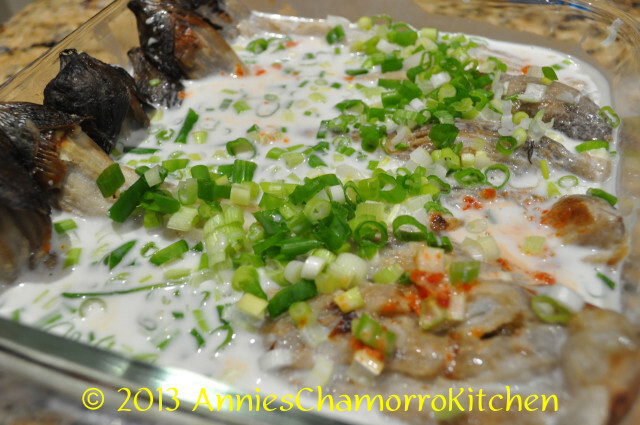 Serve with steamed white rice, fina'denne' and ENJOY! 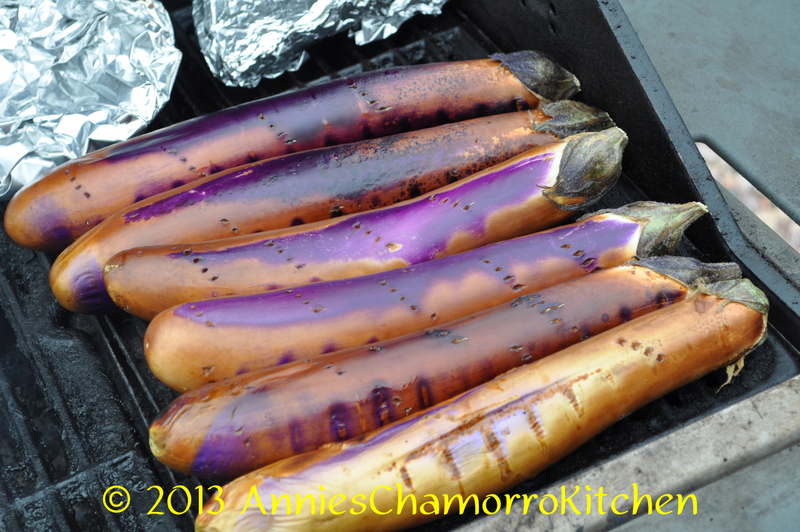 This is a classic Chamorro dish that is a staple on most fiesta menus. 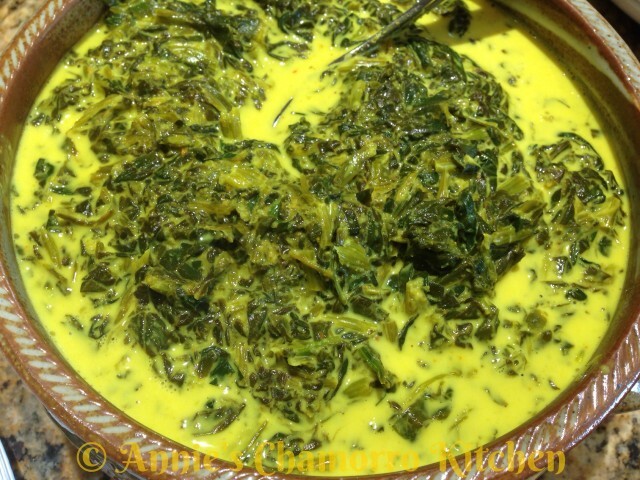 The traditional dish is called Gollai Hågun Suni, made with taro leaves rather than spinach. I still remember watching my mom make this dish the traditional way. She’d use a machete to cut a huge stack of taro leaves growing in our back yard. After rinsing each leaf, mom would stack then roll them up, cigar-like, then cut the leaves into thin ribbons. Mom then placed the taro leaves into a large pot filled with some water, cooking them long and over low heat so that the leaves can cook down and tenderize before adding freshly pounded orange ginger or turmeric (we used a hammer back in the day to pulverize the ginger root), freshly squeezed coconut milk, the juice of lemons picked from mom’s tree, and diced hot peppers from the plants growing by the door to the outside kitchen. 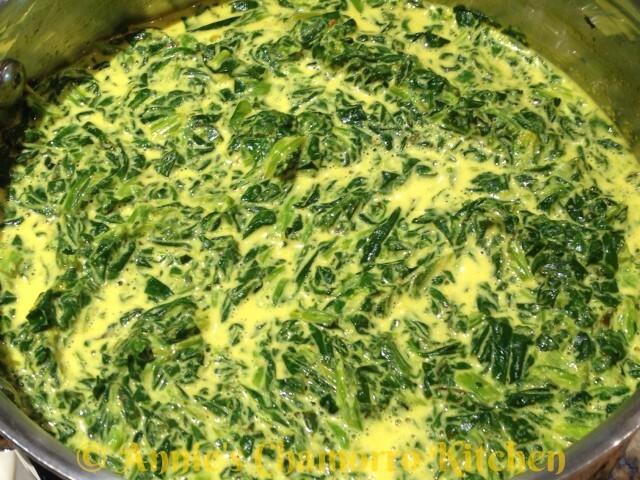 In this day and age, convenience (and making necessary substitutions due to not having traditional ingredients readily available) dictates using spinach leaves rather than traditional taro in this recipe. I buy frozen spinach that’s cooked and chopped — it saves so much time. Just defrost and drain the spinach leaves, add the rest of the ingredients, heat, and serve! 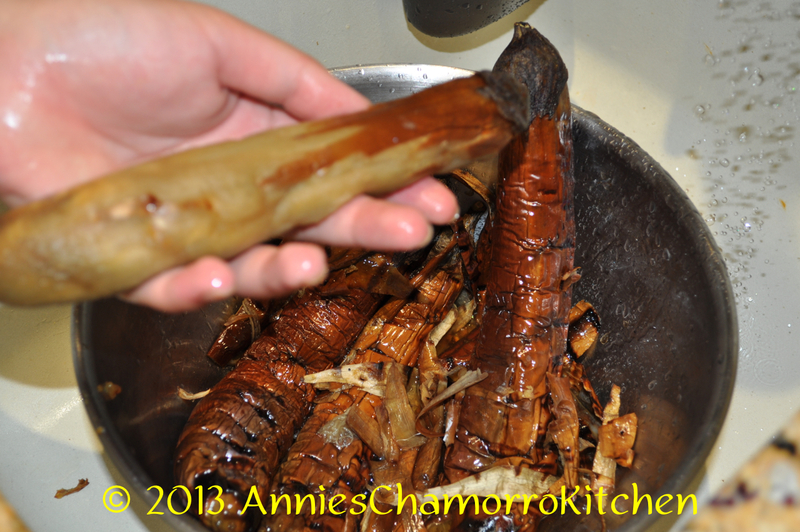 What normally takes several hours if prepared the old Chamorro way now takes minutes. 1. Place the frozen spinach in a colander (then place the colander inside a larger bowl) to thaw the spinach and allow any water to drain. After the spinach is completely thawed, squeeze the spinach to get rid of as much water as you can. 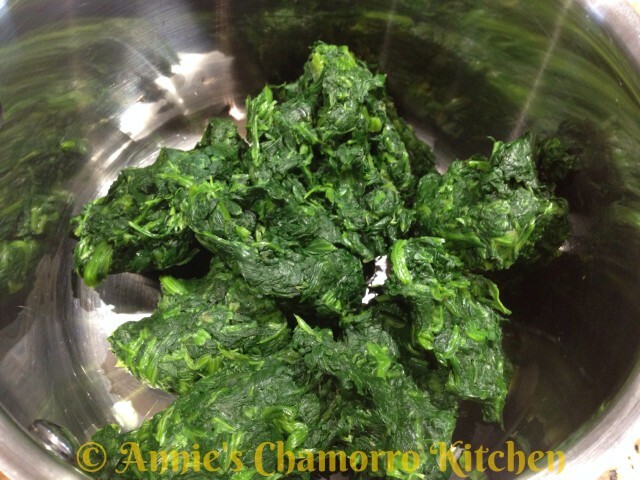 Place the fully drained/squeezed spinach into a medium-sized pot. 2. 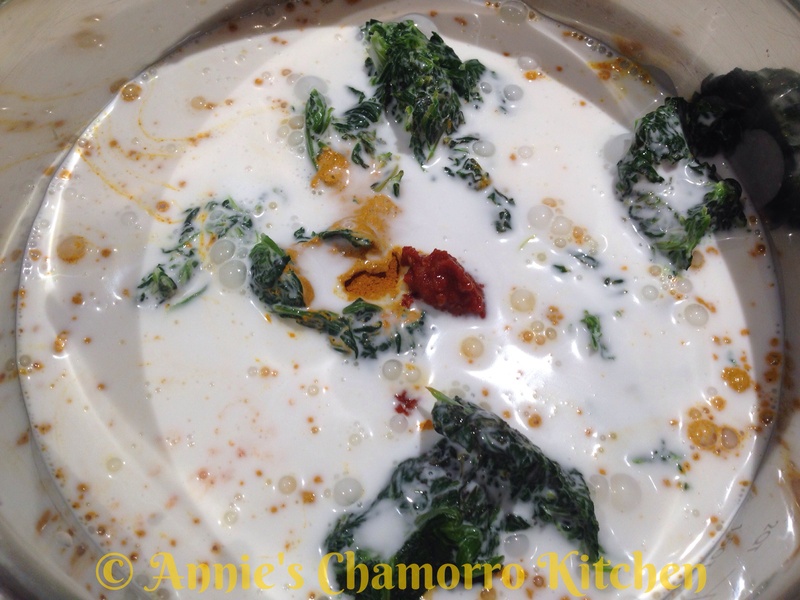 Add the coconut milk, turmeric, salt, onion powder, lemon powder, and hot pepper to the pot. Stir to combine the ingredients. 3. Cook the spinach over low heat, just until heated through. 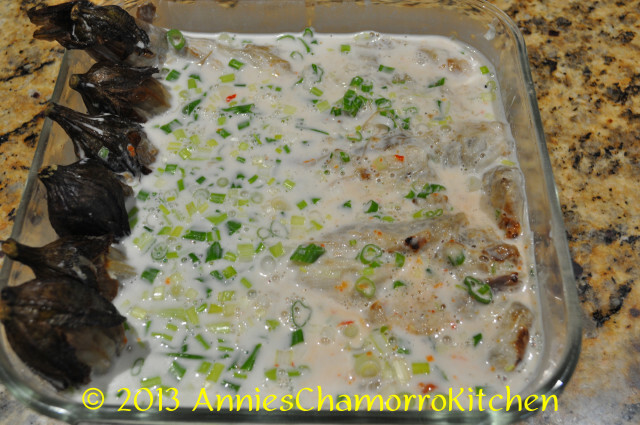 Do NOT bring the mixture to a boil or the coconut milk will start to separate. 4. 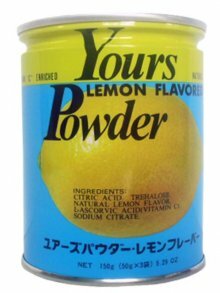 Taste and add adjust the amount of salt, lemon power or juice, and hot pepper to your liking. Serve and ENJOY!